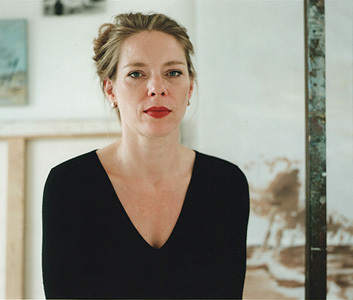 Sibylle Prange lives and workes in Berlin and Brandenburg. Sibylle Prange studied in Berlin/ Germany (Kunsthochschule Berlin-Weissensee) and Den Bosch/ Netherlands (Akademie foor Kunst en Vormgeving) and graduated in 1995 with her MFA (Diplom, Fine Arts) and in 1997 from the post-graduate program (Meisterschülerin) from the Kunsthochschule Berlin-Weissensee. Various institutions including DAAD (1994), ERASMUS (1995), Käthe-Dorsch-Stiftung Berlin (2004), Senat of Berlin (2006) and Government of Brandenburg (2018) have supported her work and studies with scholarships. She got the Art-Price of jenacon foundation (2011) and was nominated for Art-Prices like Wilhelm-Morgner-Preis (2016) and Gabriele-Münter-Preis (2017). Her works are in numerous private and public collections, e.g. Jenaer Kunstsammlungen, Angermuseum Erfurt, Schlossmuseum Gotha, Allianz Leipzig, Kreismuseum Peine, Public Collection Beit Jala/ Palestine and the collection of STRABAG. Works have been exhibited since 1990 in galleries, museums, foundations and artfairs around Europe, Israel, Palestine and Lebanon. She got teaching experiences as lecturer at Designschule Schwerin (2012-14), Universität der Künste Berlin (2013-14) and had a professorship at Vitruvius-Hochschule Leipzig (2014-17). She wants to show the present as intensely, as atmospherically as possible. To this avail, Sibylle Prange has turned travelling and seeing through global political processes into a highly potent art form. This implies the ability to turn her itinerancy into images and find painterly equivalents for what she experiences. It also means that she must constantly travel. Itinerancy is one of her natural states of being, transience the essence of many of her paintings. This allows her to gain a kind of freedom from herself and, in turn, to concentrate unreservedly on the landscape and the unexpected events around her, that is, to perceive what emanates from others. In this nomadic state, Prange looks differently, looks at unusual things, looks at difference itself. In times of worsening global threats, much speaks against travelling. But it is only by exploring the unknown that we can we know ourselves. Prange loves the sea and the desert, vast spaces where forlornness resonates with melancholy. She is inspired by concrete landscapes. She has travelled through Morocco, Israel, Syria and Jordan. She purposefully targets what she calls ‘broken locations’. These are not the tourist spots from travel brochures, but places marked by what is left when people have left. Not surprisingly, most of her paintings are devoid of human presence. Beauty is therefore altogether devolved to the overlooked and the unsightly – that which bears the traces of time. Prange’s forensic investigations are the expression of something sensual, even more so in her recent paintings than in her earlier works. Prange started out as a graphic artist, and to this day, drawing (with painterly elements) holds a firm place in her work. Up until 2004 her work as a painter focussed on heads and bodies, sometimes resulting in massive crowds of figures, and revolved around content painting. After 2006 she felt a need for clarification, which resulted in landscapes and her interest in colour slowly coming to the fore. In several recent works she has changed her colour spectrum and started to partly apply the paint with a palette knife – with a vital impulse that obeys the autonomous laws of the painting, yet still draws on the world beyond the picture. Today, the constellations in her paintings, from pigeon blue to brown, or gray blue to green, are dominated by a heightened level of creative energy. Travelling requires a willingness to expose oneself to risk; Prange accepts this risk because foreignness, while threatening, is also fascinating. Her paintings are free compositions, neither painted after souvenir photographs nor created with respect to specific event zones. They are first and foremost self-sufficient paintings. But beneath the surface, they betray much of what it means to overcome one’s own fear and suspend the need for a familiar environment. With Prange’s paintings, we are able to enjoy the profit that we usually associate with travel. Falling prey to cognitive confusion will be part of the experience. Prange’s paintings are at their best when they rely entirely on colour. Because foreignness is not a property of a person or a place. It reflects the sense of distance between oneself and the other, between the familiar and the new, which the artist articulates as physically weighted marks in spatial relationships. What we can interpret as objects are markings that convey echoes of reality, but they are also open structures that merely organise surface and depth. Prange, under the guise of a sweeping desire for boundless skies, shares very personal experiences and subjective feelings – not as a pictorial narrative, but in a substance that seems to be seeping out of the canvas (despite the fact that it was applied in the process of painting) and that is characterised by sometimes more, sometimes less figurative clarity. Each of Prange’s paintings seems provisional. As she works in series, it is no surprise that the individual constituents of each series are also a means to develop a pictorial vocabulary, that they complement each other within the series, and thus conceptually expand the series as a whole.